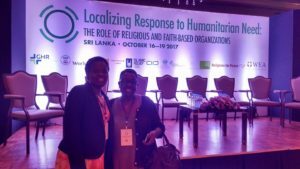 I was in Sri Lanka from October 16-19,2017 for this forum, and witnessed the role of religious leaders coming together for peace. Sri Lanka experienced war for thirty years, and stories of what religions have done there are now reshaping my mind and life. Islamic, Buddhist and Christian leaders worked together – arising as one – to build peace locally. Stories shared were to heal the memories of listeners so they could become community transformers. Now I see that the case of religious leaders in Sri Lanka can even be applied in some African countries, adapting for peace building within the local context. 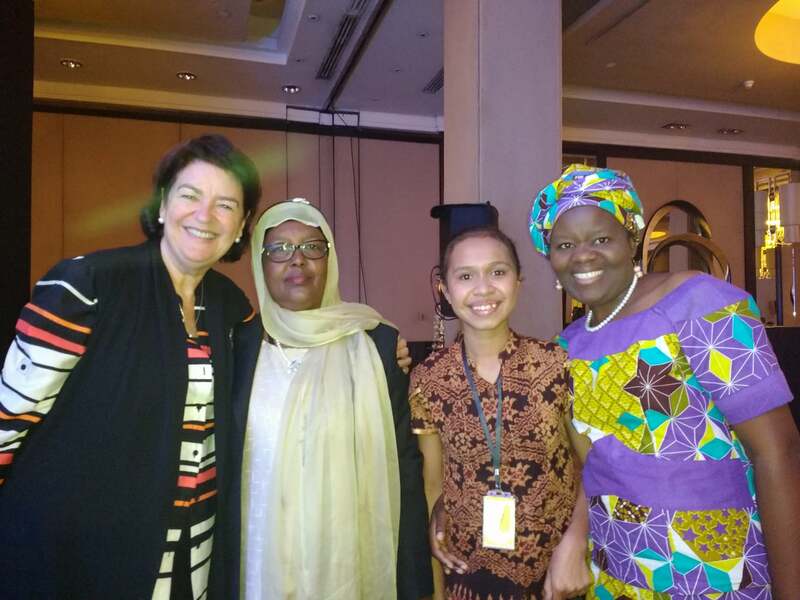 Within my context as a clergywoman living in the Democratic Republic of the Congo, one issue discussed particularly spoke to me: issues of violence against women and children. We can act together as faith leaders in order to address humanitarian needs within our communities, and achieve greater inclusion of women and children. What we live with on a daily basis is humanitarian crisis, and we need everyone to act collectively and become solution-oriented in order to improve life. These are a few ways that religious leaders can work together to achieve greater inclusion of women and children. Faith leaders must become literate on women’s and children’s rights. What is learnt within NGOs must be shared with local faith actors in the context to prevent chaos, and meet needs in times of humanitarian crisis. Local actors in religious settings should improve their literacy on human rights, and talk about them from the pulpit and altar. Human rights reflect the value of life found in many faith traditions. These rights must also be practiced within the faith community. Women and children’s voices should be heard in order to prevent violence against them. They deserve to be treated fairly. Women who do not have opportunities must be supported, especially the marginalized (due to biological racism, stigma in the community, abuse, loss of self-esteem.) Women are positive agents for change when they are given the opportunity. The best strategy is education. Education is a greater equalizer which helps people gain opportunities needed for progress and sustainable lives. For women, there is a need to keep themselves educated through reading, vocational knowledge and academic work. This knowledge can be used in advocacy with those who have been victimized and stigmatized as a result of the conflict. Educated local faith actors can be solutions-oriented, by rising together with the vulnerable, the victims, women, and children – building capacity to recover from within as local response changers. We must respect roles in the local context. In my Luba context, a woman has a noble role of cooking and caring for the children and the family. This role should be valued. When this role is not respected, all family members are in trouble. The Imago Dei (Image of God within) should be valued in all work, irrespective of the context, and gender of who is performing. Opportunities should be given to both women and men to learn, as an opener for change of attitudes. 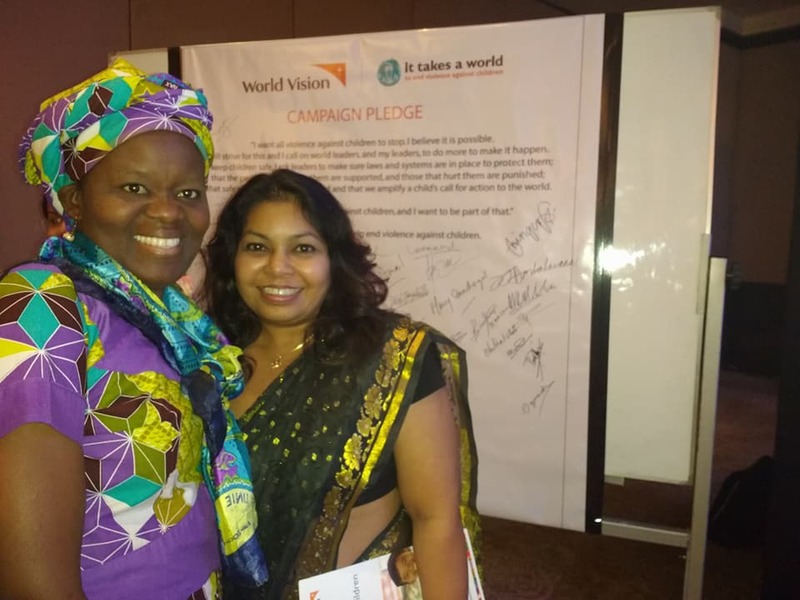 I received a Salvation Army brochure at the conference which states: “go and do something.” As the theme was about localizing response in time of gender-based violence, disaster, conflict, unrest, forced migration and displacement, I must now do something in my respective area. I hope others will join me. Harper Hill Global builds local capacity in using communications for social good. Learn more about how you can support our work! *Rev. Dr. Betty Kazadi Musau is a theological advisor and writer for Harper Hill Global, currently working on the “Non à la Stigmatisation/ No Stigma” program to combat stigma against women who’ve been raped in East Democratic Republic of the Congo.